Annapurna Pictures KiKi Layne and Stephan James play lovers in “If Beale Street Could Talk.” MUST CREDIT: Tatum Mangus -- Annapurna Pictures. In 2017, writer-director Barry Jenkins won a best-picture Oscar for “Moonlight,” an equal parts wrenching and rapturous chronicle of a young man experiencing first love that melded expressionism and restraint with a delicate but firm sense of control. Jenkins brings that same sensibility to bear on “If Beale Street Could Talk,” his exquisite adaptation of the James Baldwin novel that, coincidentally, he wrote while he was working on “Moonlight.” In a recent interview, Jenkins noted that the films share “a certain amount of aesthetic DNA.” In “Beale Street,” as in “Moonlight,” the director melds color, music and portraiture to do more than tell a story. Deliberately paced, unapologetically mannered and contemplatively attuned, “If Beale Street Could Talk” invites audiences to venture beyond the screen to connect with the characters and their world on a deeper, more mystical plane. 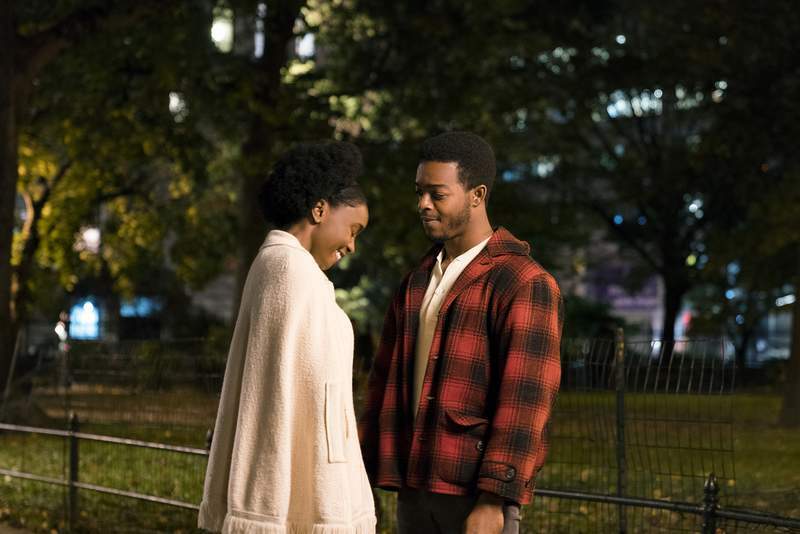 From its very first moments, “If Beale Street Could Talk” signals that it will not be a typical movie: Tish and Fonny, played by KiKi Layne and Stephan James, walk together in a New York park, their body language suggesting shyness but also intimate familiarity. As Tish narrates, what begins as a fairly conventional love scene turns out to be a flashback, slamming into her present-day reality, in which she's visiting Fonny in jail. In a chronological mosaic of memories that range from immediate to recent to more far-removed, “If Beale Street Could Talk” – which takes place in the early 1970s – chronicles pivotal moments in Tish and Fonny's romance, including the false accusation that would threaten it so gravely. “If Beale Street Could Talk” isn't executed as a smooth, seamless narrative, but as a collection of impressions that feel almost theatrical in their lush formal beauty, as Tish remembers the optimism and hope of her early love affair with Fonny – which Jenkins films in warm, burnished hues – and recounts how it came crashing down. Although Baldwin was clear about how racism and injustice structured the lives of these two, and Jenkins doesn't shy away from that analysis, polemics are secondary to drawing viewers into a world that may be filled with unfairness and oppression, but also bursts with optimism, sensuality and an adamant insistence on self-worth. Layne, a newcomer to the screen, exudes an almost lamblike naivete, as Fonny sweeps her into his life as an artist, inviting her to share his cramped studio and then looking for a loft to rent once they get married. They're a handsome couple, their physical attractiveness and attraction to one another doing as much expressive work as flowery dialogue or grand gestures.